Amika – a name of Latin origin meaning ‘loved friend’. Also the name of a rebellious hair tool company who carry hair care and hair tools with vibrant, eye-catching packaging. But you may wonder what is the quality like? Do Amika products offer good value for money? Do they have more to offer than style? I will help to answer these questions for you in my review of the Amika 1.25 Inch Ceramic Styler, Obliphica. Read on for all of the information I could gather up about this Amika hair straightener. Amika is a hair company that found it’s beginnings in Brooklyn in 2007 by industry outsiders. They stand for experimentation over perfection, fun over elite, individuality over conformity, collaboration over ego and hair before clothes. This itself says a lot about what this company is about; definitely unique! Amika likens their products to a good friend – as the name suggests. They are continuously looking for new technologies and ingredients to provide customers with products that are high-performing. The plates on this hair straightener are 100% ceramic. Ceramic provides even, quick heating that results in shiny, soft locks. The plates are floating which means they will adjust to tension and will not snag your hair. 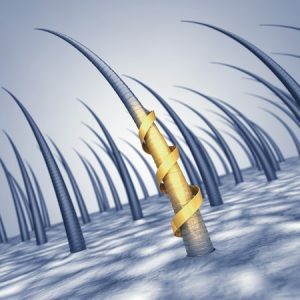 They generate ionic, infrared heat that heats the hair from the inside out, protecting the hair cuticle from heat damage and locking in moisture. The negative ions that it emits will close the cuticles and smooth the hair out. Not only can you straighten your hair with this styler, but curl and wave with it as well. Here are some techniques you can try! 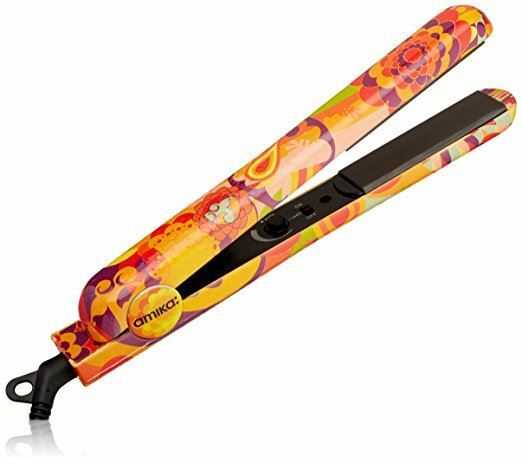 The temperature range on this ceramic hair straightener is between 140°F and 450°F. This is a good range that allows users with any hair type to make use of this styler. For thin hair, it is ideal to stay below 250°F. For normal hair the ideal temperature is under 360°F and for thick hair you can go over temperatures of 360°F. For more information on flat iron temperatures for your hair type, check out our buyer’s guide. The temperature control and on/off switch are on the inner side of the iron near the plates. See picture. Can you travel with Amika’s 1.25″ ceramic styler? Yes, you sure can as it includes dual voltage: 110-240 V. American appliances run on 110 volts but most countries run between 220-240 volts. Keep in mind that you will still need a plug-in adapter when you travel internationally. The easy-grip cord on this Amika iron is 9 feet long. It can swivel around 360° which is very convenient when you are working your way around your head. It is made of heat-proof fabric and includes a hook that can be used for easy storage. As an added bonus, the Amika flat iron comes with 2 hair clips for sectioning the hair. The print on the straightener itself has to be mentioned because it really stands out. Not only is it pleasing to the eye but it will definitely be easier to find wherever it gets stowed away while not in use because of its vibrant colors and patterns. It comes with a 1 year warranty. The catch to the warranty is you need to have a copy of the receipt and you will be charged a flat fee for shipping and handling. It has a high temperature range making it great for all hair types from thin to thick. 100% ceramic floating plates that heat up quickly and evenly. You can travel anywhere with it because it has dual voltage, 110-240 V.
It does not have auto shut-off. Be careful not to leave it on while it isn’t in use. The warranty is only 1 year and shipping/handling charges apply. There you have it: our Amika ceramic flat iron review. It’s got the whole pretty package for an affordable price. The 100% ceramic plates provide the user with quick, even heating and an easy glide over your locks without snagging. The infrared heat penetrates the hair from the inside out, saving the hair from heat damage and creating a shiny, silky result that is sure to turn heads. With dual voltage you can even take it on your travels! This flat iron has beauty and brains.